Red Hat Training’s hands-on, task-focused courses help IT professionals and developers build the skills they need to implement real-world changes—better and faster. We’ve helped nearly two-million students worldwide get the most out of their Red Hat technology deployments. Learn directly from the source and get the most relevant, current, and comprehensive education available anywhere. Next, prove your or your staff’s true capabilities through our Red Hat certification program. All Red Hat certification exams are performance based: candidates for certification must show they can perform tasks similar to those you would find in real-world scenarios. We offer students and organizations a variety of ways to train, including traditional classroom-based instruction, instructor-led virtual classrooms, self-paced online learning, and private team training. With more than 30 courses, we deliver training on almost all Red Hat products. Our courses are all lab-based and hands-on, meaning students spend the majority of their class time practicing the same important tasks they’ll perform back at their job. Students learn from certified instructors who only teach on topics on which they themselves are experts. Red Hat’s performance-based certifications are among the most highly regarded in the IT industry. A Red Hat certification means you’ve proven your skills by conducting performance-based testing of the tasks you need to perform your job. Red Hat certifications prove that you’ve mastered key tasks for Red Hat Enterprise Linux, Red Hat JBoss Middleware, Red Hat Enterprise Virtualization, and more. Organizations hiring employees, contractors, and consultants can look to Red Hat certifications as input while making hiring, assignment, promotion, and other management decisions. Similarly, individuals who earn these certifications benefit by having official, impartial validation of their skills and knowledge. Hear how the Red Hat Certification Program is improving their credentials to now include OpenStack, and learn about new ways to find talent through Certification Central. A Red Hat Certified System Administrator (RHCSA) demonstrates the core system administration skills required in Red Hat Enterprise Linux environments. A Red Hat Certified Virtualization Adminstrator (RHCVA) has a system administrator’s ability to deploy and manage virtual hosts in production environments using Red Hat Enterprise Virtualization. 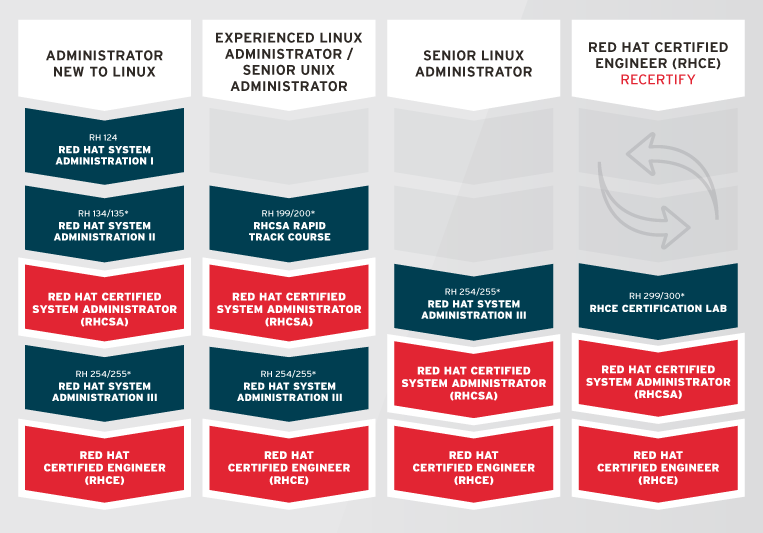 Red Hat Certified Engineers (RHCE®) display the knowledge, skills, and ability required of senior system administrators to perform deployments and migrations on Red Hat Enterprise Linux systems. Those with Certificates of Expertise demonstrate advanced or specialized skills in one or more of the following areas: network services security, deployment and systems management, clustering and storage management, performance tuning, directory services and authentication, SELinux policy administration, virtualization, ESB, Persistence, or Seam. A Red Hat Certificate of Expertise in Server Hardening means you have the skills necessary to implement server security hardening practices aligned to commonly used security specifications, such as SCAP and PCI. Red Hat Certified Architect (RHCA) is the most senior-level system administration credential earned by an RHCE. A Red Hat Certified JBoss Administrator (RHCJA) displays the ability to deploy, implement, and manage Red Hat JBoss Enterprise Application Platform and its applications. A Red Hat Certified JBoss Developer (RHCJD) demonstrates the ability to build Java Enterprise Edition (JEE) applications for deployment on JBoss Enterprise Application Platform or other JEE-compliant platforms. An IT professional who has earned the Red Hat Certified System Administrator in Red Hat OpenStack certification has demonstrated the skills, knowledge, and abilities needed to create, configure, and manage private clouds using Red Hat Enterprise Linux OpenStack Platform. Those with the Red Hat Certificate of Expertise in Camel Development demonstrate the skills, knowledge, and abilities needed to create and maintain enterprise integration services based on the Red Hat JBoss Fuse Camel framework and APIs.